1st State BIKES: Who better appreciates DelDOT ... drivers or bicyclists? Who better appreciates DelDOT ... drivers or bicyclists? Traffic . . . they don't care about us. Ya know, they want the pot holes fixed, yet, they want you out of their way. So . . . you have to deal with it. Hopefully, DelDOT's crews understand that most of us in the bicycling advocacy community do appreciate their efforts to make our roads safer. Bicyclists even passed a bill that identifies roadside construction workers as vulnerable road users, adding additional penalties. 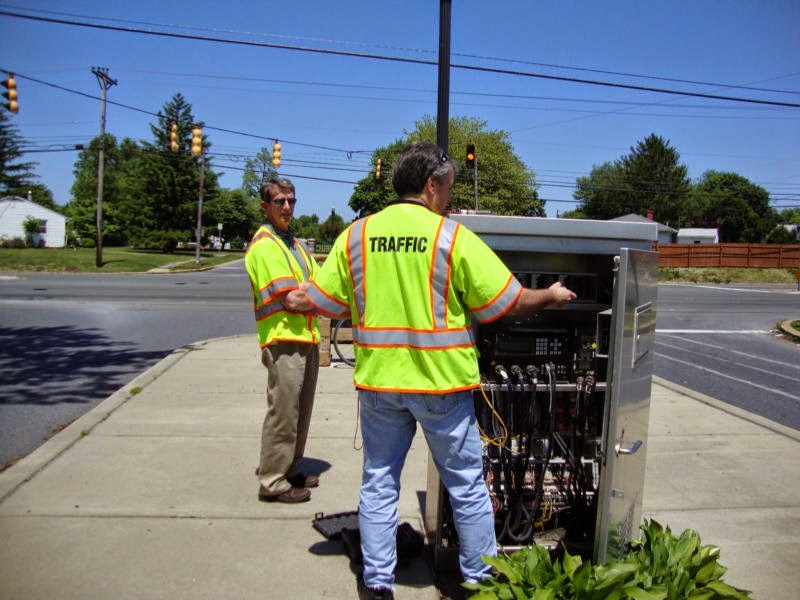 Technicians from DelDOT Traffic adjust a faulty detector at the intersection of Route 273/Brownleaf Road. The signal was not tripping for bicyclists, and was reported by Bike Delaware's then Vice President, Caroline Honse. (photo by Caroline Honse).